Pizza may not be the first thing one would think of to make homemade. After all, there are pizza places everywhere. However, homemade pizza is just so yummy, healthier, and you get a lot more pizza for your buck. Besides, to make it is easier than you would think. So let’s get started. 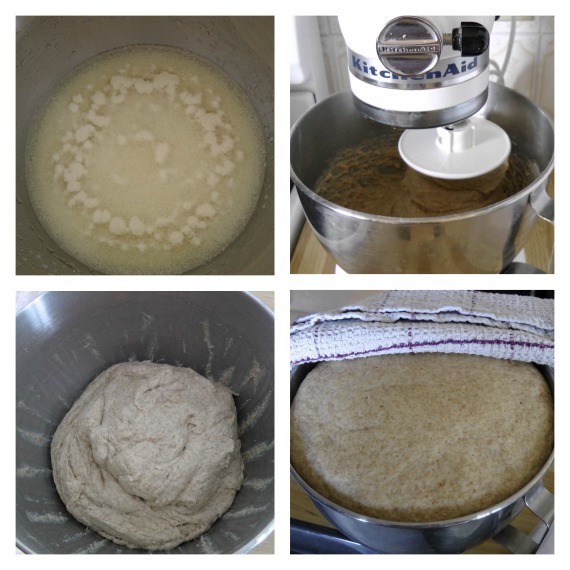 I use whole grain spelt, freshly ground and let my KitchenAid Mixer mix the dough. It makes a great dough and is convenient. It can be made with hands, too. It is the same dough recipe as my dinner rolls except for pizza I do not add an egg. And yes, I go by gram using a Kitchen and Food Scale because that way it is perfect every time. My kids’ teenage friends call my pizza ‘The Best Pizza in Town’ – yeah! I keep the toppings very simple. Always ketchup first and cheese last. 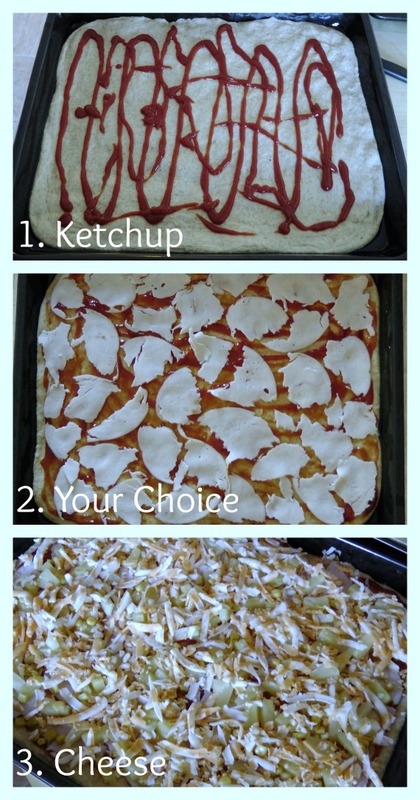 Yes, I simply use ketchup, it really does make a great pizza sauce ;). You don’t need much, just to spread it evenly all over. For cheese I like Gouda (mostly too expensive in North America), Mozzarella, or Marble cheese. 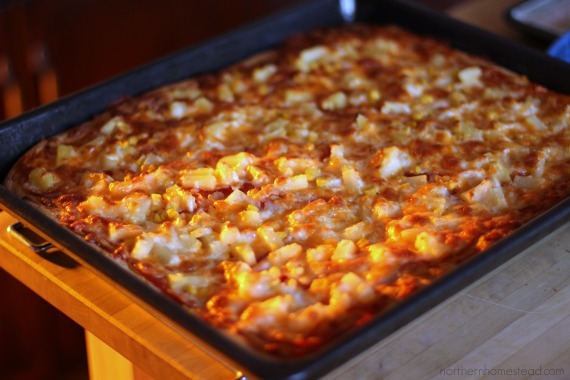 Other ingredients might be ham and pineapples for a Hawaiian Pizza, or salami for a simple Pepperoni Pizza. Onions, ham, mushrooms and olives fare also great choices. There are no limits when it comes to homemade pizza toppings, just add what you like and what you have on hand. It is all your choice, have some fun with it! Now preheat your oven to 400F. If you have a Pizza Stone , great, use it. I do not and always bake very yummy homemade pizza without a pizza stone. Bake for 18-20 minutes. I like to bake one sheet at a time, even in a convection oven – it just bakes better. Serve hot and enjoy! 725 grams = 25.57 ounces flour. I like to use freshly ground spelt. You can use any flour. Ketchup, your choice toppings, cheese. Some oil to grease the backing sheets. Anna, I’ve never made pizza dough from scratch. I don’t know why, but I just never have. I would love to try it. I bet your pizza is the best in town. It sure looks yummy! Thank you, Alli! Have fun trying it, I am sure you will love it. I always use the kitchen aid mixer, it dies the job beautifully for me. But I have not heard of ninja for dough, thanks for sharing. We like to make homemade pizza too, but we haven’t since I got my Kitchen Aid mixer. We should do it again soon. We use spaghetti sauce for the pizza sauce and like one with just pepperoni and cheer and one with the works.Thanks for sharing how you do it! I will keep in mind that ketchup can be used for sauce if I am out of my normal one. I would have never guessed it. I do not even know how I started with ketchup, I am sure spaghetti sauce is great too. Thank you for sharing. Ah Anna – this looks amazing! I’ve been wanting to try making a pizza crust made from cauliflower and lots of healthy veggies and toppers like this. I think we’ll give it a try – thanks for the inspiration! Thank you, I am sure you will like it! We love making home made pizza. My husband usually does it with the grand children. I prefer a white sauce like alfredo but my husband is a tried and true pizza sauce man. Your pineapple pizza looks really yummy! Although we have not made our own pizza dough, there is not good reason not to. We have the dough hook with our Kitchen Aid. I shall put that on our agenda! Thank you for pinning Shirley! 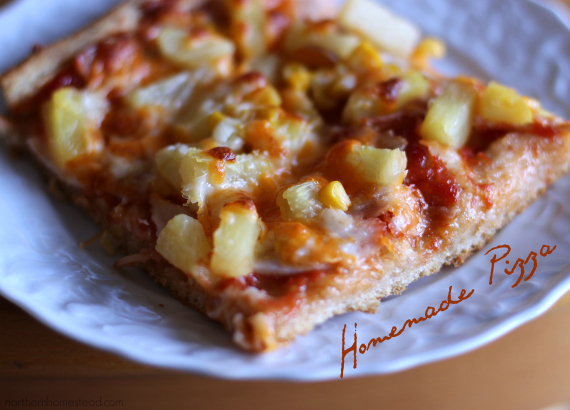 There are so many ways to make homemade pizza, great idea to do it with grand kids, I am sure they love it. Love all this ideas. Thank you for sharing, Kim! Hi Anna! I’m hopping over from Let’ Get Real today. Your pizza does look delicious. With a good crust, a hardly care what is on the pizza. I do have to say though that you are the first person I’ve met that uses ketchup for sauce. I bet it tastes great, but I never would have thought to use it. We just made pizzas for our pizza and movie night with the kids. Nothing goes better with the movie Frozen than homemade pizza. At least my kids think that. Movie nights and pizza are fun, enjoy! Anna, can the dough be frozen so I can make up some in advance? I love your posts, they are so easy to read and follow. Thanks for you time and God Bless. I haven’t tried freezing the dough, but I do freeze pizza all the time. Usually I make portion sized pizzas for the freezer, put them in ziploc bags and they are ready to go. Great for take out lunches. Thank you Kim for your kind words. Blessings!